A closeup of the picture of my grandparents’ that hung over their TV. If you have any information about it please drop me a line or comment on the page. A closeup of my grandparents’ picture that hung over their TV. The print is by an artist by the name R Atkinson Fox. 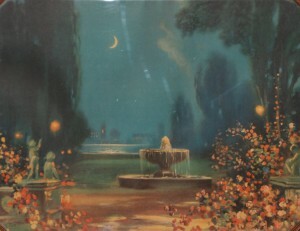 It is called “Night Garden ” . Thank you for sharing your story. Hastings was a wonderful place to grow up wasn’t it?